Fit! is pleased to offer both a men's and women's sauna! Kick back and relax after your intense workout in our new infrared sauna. Enjoy the benefits of weight loss, pain relief, stress/tension relief, and cardiovascular improvement while also detoxifying your body! Contact us at 410-243-8348 with any questions. Weight Loss: You can Lose up to 10 pounds in 30 days with regular infrared sauna use while you Relax and Unwind. Far Infrared Radiant Heat can Burn 450 – 900 calories in a 40 minute session! Sweat Off Pounds and Inches without a Special Diet or Exercise! Far Infrared Heat actually Breaks Down the Water Clusters that contain Fatty Cells and Toxins, which allows the body to Sweat Out this Cellular Waste through the Pores of the Skin. When the Core Body Temperature reaches 100 -101 degrees F, the Resonant Absorption Effect Literally MELTS Fat and Cellulite while you Sit and Relax! Detoxify Your Whole Body: Far Infrared Heat Therapy is Absolutely the Safest, Most Efficient Detoxification Method for Expelling harmful Environmental Toxins, Acids & Heavy Metals from the body!! Detoxification is the Foundation for Responsible Family Health Maintenance. Pain Relief: Healing Therapy with Far Infrared Saunas provides Real, Lasting Relief for: Nerve Damage, Arthritis, Fibromyalgia, Muscle Pain, Carpal Tunnel and Joint Pain. No Pills, Potions or Lotions! Infrared Heat Penetrates Directly to the Pain Source to Heal and Soothe Naturally. Eliminate Stress and Tension: Relax and Melt Away the Buildup of Daily Stress and the Tension of the Workday Grind. Feel the glow of deep penetrating Infrared heat as it Soothes and Heals your body naturally. Say “Goodbye” to everyday Stress, Tension, Sleep Apnea and Insomnia. You will be More Relaxed, Tension Free and Sleep like a Baby. Full Cardiovascular Workout: Medical Studies have Documented Far Infrared Therapy Lowers Blood Pressure, improves blood circulation and rebalances the body’s metabolism. A sauna session is a Genuine Passive Cardio Workout without exercise! Organic Skin Care: Infrared Sauna Treatments dramatically Renew Elasticin-Collagen Tissues while Crow’s Feet, Forehead Lines, Wrinkles, Age Spots, Scars, Varicose Veins and Stretch Marks Naturally Fade Away. Look Younger while you Cleanse Your Body from the Inside Out. Chronic Skin Conditions like Acne, Dermatitis, Eczema and Psoriasis literally Vanish. Infrared Energy Purges Clogged Pores, Neutralizes Infection and Hydrates Skin. You will Love the Soft Smooth Glow of Your Naturally Clear Complexion. Cancer Therapy: Far Infrared Therapy has been applied as Cancer Treatment Worldwide for 20 years. Far Infrared Saunas Increase the Production of White Blood Cells, Killer T-Cells, and Interferon which Fight Cancer Cell Growth. Radiant Heat actually Kills Mutated Cancer Cells! Healing Power of Infrared: Healing Time for Damaged Tissues, Muscles, Tendons, Ligaments and Nerve Endings is Greatly Reduced. Increased Blood Circulation and Vasodilation of Blood Vessels Speeds Beneficial Nitric Oxide and Healing Oxygen to the Distressed Areas, while Removing Toxins and Lactic Acid. Enhanced Cell Regeneration will give you More Energy, Stamina and Mental Clarity. MYE AppAudio™ is FREE for Members to Enjoy Club TV Audio on Apple and Android Devices! Easy member AppAudio downloads from iTunes or Google Play stores provide mobile club TV audio listening anywhere in your facility. Dialog Enhancement feature for best audio quality during noisy peak hours and for the hearing impaired. Listen to your favorite sports, tv show, news, or movie anywhere in the gym! The exercise everybody loves to hate is now more enjoyable with the cardio theater! 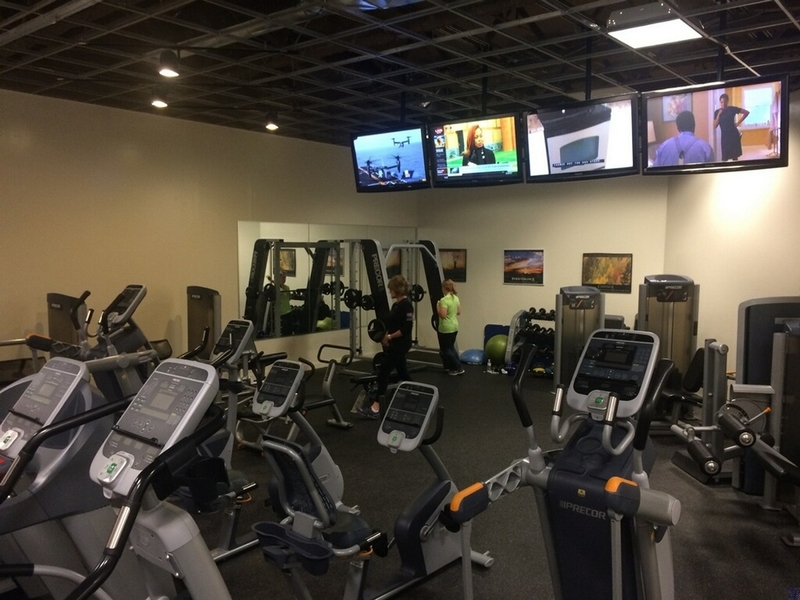 Hop on a treadmill, elliptical, bike, or AMT and burn those pounds off while enjoying your favorite movie, TV show, or sports game! A private, less intimidating workout environment created SOLELY for women!